The New York City Police Department is seeking the public’s assistance in identifying and locating a man who assaulted an off-duty NYPD detective in the confines of the 13th Precinct. Last Saturday, a 29-year-old off-duty NYPD detective was standing on the southbound 6 train platform at the 23rd Street and Park Avenue station at 6:23 p.m. when the other man punched him. The blow knocked the detective down onto the platform, where he hit his head and sustained a severe head injury. He was taken to Bellevue Hospital in critical condition. The suspect, who was accompanied by two women, fled the subway station on foot. According to the Daily News, the detective had gotten into an argument with the man before the suspect punched him in the face. Gothamist reported on Sunday that the cop is now in a medically-induced coma. 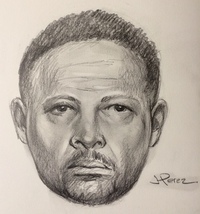 The suspect is described as a black man in his early 40s, approximately 5’9” and 200 lbs. He is described as wearing a white T-shirt and blue jeans. ‘RECKLESS’ CYCLIST NABBED ON THIRD AVE.
Police arrested 36-year-old Shi Chen for reckless endangerment at 344 Third Avenue last Tuesday at 12:25 p.m. Chen was riding his bicycle on Third Avenue approaching East 25th Street. He was allegedly speeding and went through a steady red light. When he was going through the intersection, he almost hit a woman who was crossing the street in the crosswalk with her baby, police said. EXPOSED ON E. 23RD ST.
After responding to a complaint from a pedestrian about man exposing himself on the sidewalk, police arrested Jason Ecnatiowicz, 33, last Tuesday, in front of the Foundry building at 310 East 23rd Street. Police said upon searching him, they found that he was allegedly in possession of a pipe with unknown drug residue and an unlabeled bottle of pills. He was arrested for alleged possession of a controlled substance, but not public lewdness. Twenty-six-year-old Cikizwa Nkonzombi was arrested for assault at 112 East 23rd Street last Wednesday at 1:16 p.m. The victim told police that Nkonzombi was upset about the amount of money she was being charged in lawyer fees. She allegedly became enraged and began to throw paper around and strike the victim, who sustained small scratches to his hands. Police arrested 20-year-old Shadi Torres for grand larceny last Wednesday at 12:24 a.m. in front of 601 East 20th Street. Torres allegedly entered a utility vehicle that had been left unattended and then went joyriding, hitting three vehicles and causing damage to those vehicles and the truck that he was driving. Police arrested 28-year-old Duraiarasan Arivudai for sexual abuse in front of 161 West 15th Street last Monday at 6:49 p.m. The victim told police that she was walking east on the sidewalk when Arivudai ran up to her and pushed her against a UPS truck, causing her to hit her head on the truck. Arivudai also allegedly grabbed her head and tried to kiss her. Thirty-six-year-old Ping Du was arrested for violating New York State law in front of 101 West 25th Street last Friday at 4 p.m. Du allegedly gave a massage to an undercover officer and could not produce a valid New York State massage license when asked. Police arrested 55-year-old Mark Gaffney and 17-year-old Tairyn Rosario for possession of marijuana at 3 East 15th Street last Monday at 8:23 p.m. Gaffney and Rosario were allegedly each holding a joint in plain view on a public sidewalk. Police arrested 57-year-old Marcos Cardenas at Sixth Avenue and West 26th Street after Cardenas was seen allegedly smoking synthetic marijuana. A fourteen-year-old boy was arrested for grand larceny in front of 22 East 17th Street last Wednesday at 3:15 p.m. A man told police that he had left his Under Armour bookbag under the seat unattended at McDonald’s while walking his friend out to the front. After he returned to his seat, he saw that his bag was gone. A little while later, an NYPD lieutenant saw the teen at 22 East 17th Street. The teen was looking through the bag and seemed excited that there was a laptop in it. After the teen was arrested and brought to the precinct, the victim confirmed that the bag was his. The value of his stolen property was $1,655. Police arrested 46-year-old Adolphus Ward for trespassing at the Chase bank at 501 Second Avenue last Wednesday at 6:57 a.m. Ward was allegedly inside the bank’s ATM area without permission. Police arrested 45-year-old Kenneth Finch at 60 West 23rd Street last Wednesday at 2:57 p.m. for possession of burglar’s tools. Finch was allegedly cutting a lock that secured a bicycle at the above location and the victim confirmed that it was his bike. Finch was also in possession of a knife that was bigger than four inches, police said. Forty-nine-year-old Gabriel Blake was arrested for weapons possession last Tuesday at 12:45 p.m. in front of 177 West 25th Street. Blake was suspiciously looking into the plastic bag that another man was carrying and he was allegedly carrying a gravity knife in public view. He also had a small gravity knife in his wallet, police said. ‘DRUNK’ DRIVER NABBED AT SIXTH AVE.
Police arrested 27-year-old Rosemary Lee for intoxicated driving at Sixth Avenue and West 26th Street last Thursday at 1:19 a.m. Lee was allegedly operating the vehicle with an obstructed license plate and when she was stopped, police found that she appeared to be driving under the influence of alcohol. She was tested at the scene with a portable Breathalyzer and recorded a level of .134. Police arrested 50-year-old Garry Boake for possession of a controlled substance at Broadway and West 28th Street last Thursday at 3:45 p.m. Boake was allegedly purchasing marijuana from another unapprehended person at the corner and when police searched him, they found that he was in possession of a controlled substance. Police have been regularly making arrests of people sleeping or lying on benches in public parks or being in the parks after hours. Last Tuesday morning, police arrested 38-year-old Jose Orta for lying on a bench at Stuyvesant Cove Park at East 23rd Street and the East River.